A Welsh contractor I work with wished me well in the Six Nations and commented that it was good to see Johnny Wilkinson back. When he said 'me' he meant 'us' and by 'us' he meant England. Although i was born in England, and speak with an English accent, I'm half Scottish. I feel Scottish. Perhaps its some kind of underdog spirit, maybe its my tough working class Broxburn ancestry feeling more 'real' than my comfortable south-east middle class upbringing, maybe it's simply that Scotland had a better football team in my formative years. Whatever it is, I am more spiritually aligned to the Scots. I don't feel English, I don't subscribe to the English way. I don't want to be known a jumped up little twerp who expects to have a seat at the global top table. In essence this is what it means to be English; whether its the overpaid, arrogant, under performing football team or their increasingly hysterical cricketers. I've never wanted the rugby team to do well; which has a lot to do with Will Carling who is the classic English nob end, and I constantly find myself hoping that the cricketers can find new depths of awfulness on the current Ashes tour. I dream of seeing them all out for 6 runs or something. None of which is particularly patriotic. 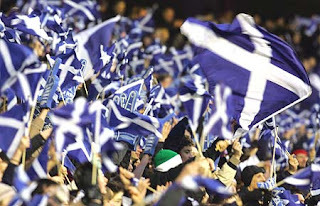 On the football pitch I follow the fortunes of both countries, but when they come together, I follow the Scots. This is not the most rewarding of strategies, it must be said. In fact, this half and half split does leave me somewhere in the middle of nowhere. I would never be accepted by the Tartan Army but I cannot assimilate myself to the Barmy Army. I'm like an ignored minority, I feel isolated and persecuted, I could roll my eyes and frown with some vigour such is the institutionalised racism I face every day of my life. Gross generalisation, perhaps, but it is how the English are marketed. Especially in sport. The English profile, money and the general expectations are totally disproportionate to actual performance. I find it hard to subscribe to the English sporting 'brand' that says we're a global sporting superpower cursed with bad luck. I don't find it a particularly English endearing quality. There are many endearing English qualities, but this isn't one. All in all, I'd probably prefer to be Swedish, everyone loves the Scandinavians.